Discover Charleston, "The Friendly City". Are you interested in obtaining more information about attending Eastern Illinois University or participating in a campus tour? Our admissions office is willing to help you, or just give them a call at 1-800-252-5711 or visit their website. The Tarble Arts Center is a major cultural arts resource serving east-central Illinois. Its founding purpose is "to take the arts to the people." A division of the College of Arts & Humanities, Eastern Illinois University, the Tarble serves the people of the region by providing arts activities and related programs. The Tarble is the only facility on Eastern's campus built entirely through donated funds, with the primary gift of one million dollars donated by the late Newton E. Tarble. To find out more information about the Tarble Art Center, contact them by phone at (217) 581-ARTS(2787) or visit their website. 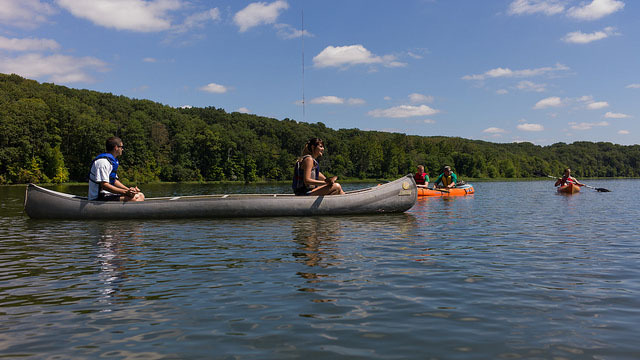 Fox Ridge State Park offers another unique outing for anyone who enjoys nature. The 752-acre park is known for its thickly wooded ridges and miles of scenic hiking trails. Fox Ridge is situated on the forested hills along the Embarrass River. This site, in combination with Lake Charleston, offers perfect nooks for fishing, camping, canoeing, hunting or family picnicking. For more information about Fox Ridge State Park call (217) 345-6416 or visit their website. Charleston enjoys a rich historical heritage, strong economy and agricultural base, diverse shopping, a variety of recreational activities, exceptional educational opportunities, an extensive health care system, theater, music, art and much more. Whether your interests are in relocating, starting a business, attending the university, or retiring in the area, Charleston has something to offer. For more information from the Chamber of Commerce call (217) 345-7041, or visit their website. Lincoln Log Cabin State Historical Site is a special attraction for both residents and visitors. The site, located just south of Charleston, is the 1840's farm and home of Thomas and Sarah Bush Lincoln, parents of our 16th president. Volunteer pioneers keep history alive at this unique farm by continuing daily domestic and farming activities as they were done more than 100 years ago. For more information about the Lincoln Log State Cabin call (217) 345-6489, or visit their website.